Providing you the best range of 243 thread sealing adhesive and thread sealing 542 with effective & timely delivery. We offer a comprehensive range of 243 Thread Sealing, which is formulated for the locking and sealing of threaded fasteners between 1/4" and 3/4" (6 to 20 mm). 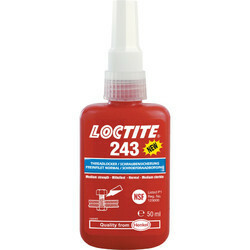 This tip pick Loctite® 243™ Primer less, Oil Tolerant Removable Medium Strength Blue Thread locker is capable of working on both active metals like brass, copper and also on passive substrates such as stainless steel and plated surfaces. 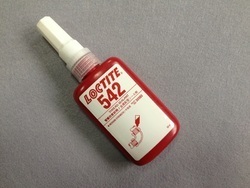 A recommended replacement for Loctite 2440™, it has the property to tolerates minor surface contamination from various oils, such as cutting, lubrication, anti-corrosion and protection fluids. Formulated using accurate composition of pure chemical compounds and in adherence with laid industry standards, our range of Thread Sealing 542 finds extensive usage in construction, engineering and various other industry. Highly effective, this sealants are ideal for fine metal threaded fittings as used in especially hydraulic pipes, pneumatic & general fittings. Stringently checked and tested, the range is also offered with DVGW approval (EN 751-1): NG-5146AR0855. Looking for Thread Sealing Adhesive ?